AS the taxi drives up to the main entrance of St Regis Astana, I am momentarily mesmerised by the large statue of black horses right at the centre of the entrance called the Yurt Arrival. A cheerful Kazakh doorman of medium height opens the white Kia Serato door and welcomes me to the hotel. I smile at him, nod my head and say “yes” while rummaging through my handbag to find my handphone. I thank him and proceed to walk into the grand lobby of the 41st St Regis brand hotel in the world. I look around the lobby that is furbished with plush grey, white and dark blue sofa and chairs and admire its exquisite decors. The hotel exudes luxury resort stay instead of purely serious business. While I sit on the most comfortable black leather chair waiting for my room key card, I am greeted by some of the hotel staff who all wish me “Happy Birthday”. 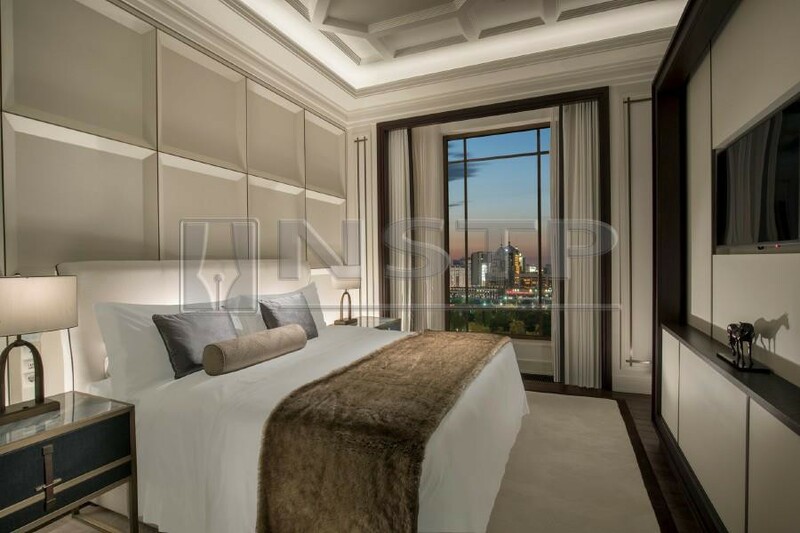 building boasts a new height of luxury with a traditional Nomadic twist to pay homage to the Kazakh culture. St Regis is known for its signature butler service that strives to provide a pleasantly unforgettable stay for its guests. I am welcomed by a friendly butler as I reach level eight. He proceeds to lead me to my deluxe room, which overlooks the frozen and snow-covered Ishim River. 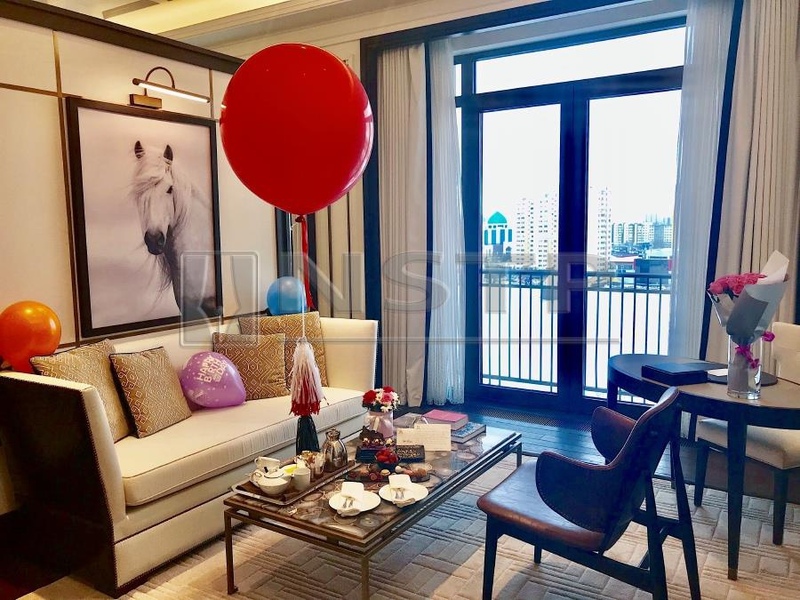 “Happy birthday Ms Bahari,” butler Zhan wishes me as I enter the room decorated with colourful balloons, flowers and a big “Happy Birthday” sign. To top it all off, there is a cake, some macaroons and truffle chocolates, a bowl of fresh strawberries and a birthday letter—with compliments from the hotel — placed beautifully on the marble-topped coffee table. Before leaving, the butler prepares St Regis’ signature peach oolong tea. I sip the freshly brewed tea and instantly feel rejuvenated. I then explore the open-floor concept room while recording each moment to share on my Instagram stories. The room itself is breathtaking. The signature king-sized St Regis bed, covered with crispwhite linen and topped with blue and grey faux-fur throws and pillows, is inviting. As you lie on the bed and lookup, you will see the white, lofty, coffered ceilings and straight ahead is a 55-inch LED television, on which you can enjoy watching Russian and English language channels. Adjoining the bedroom is a private living area with a dark wood bookcase, a white plush sofa as well as a desk and desk chair. The bathroom screams all things majestic with the grey and white marble walls and floor. The centrepiece is, of course, its big white bathtub and mirror-embedded television. It also has a walk-in rainforest shower and a separate toilet with bidet. All of its toiletries are the famous French brand, L’Occitane. The floor-to-ceiling windows boast the stunning view of the Ishim River, the new 300-metre white pedestrian bridge and part of St Regis Astana’s Winter Garden, a yurt-inspired ballroom that speaks volume of how the luxury hotelpays great respect to the Nomad dwelling from 3,000 years ago. I fall in love with the hotel not because of its luxury decor. But because I feel truly welcomed here by the friendly and helpful staff. They really are making my birthday a memorable day. I sleep fitfully throughout the night and wake up the next day feeling refreshed, although I am a year older. I am hungry and ready to delight in the delicious breakfast buffet at the hotel’s fine dining restaurant, LaRiviere. Here’s a tip for women who plan to eat all they can — wear loose clothing. The spacious deluxe room was decorated with colourful balloons and flowers. La Riviere has its own unique history. The Italian restaurant was opened in 1997 in Astana, when the city just became the capital of Kazakhstan. Political and business meetings were held at the restaurant that overlooks the river and patronised by famous leaders, celebrities and sportsmen from around the world. St Regis Astana prides itself as a social centre of the city, hence the hotel honours the legacy of La Riviere by upgrading the restaurant and keeping its name as it originally is. The breakfast spread is fantastic with assortment of fruits, cheese, cured meat slices, pastries as well as different types of honey and juices. I order the restaurant’s signature breakfast pancakes and cappuccino. If you crave for buttery and fluffy pancakes in Astana, La Riviere is the place to go. I also try the Asian-style prawn. The prawns are freshand juicy, something that is rare in this land locked country. It reminds me of home. I sit next to the window and enjoy my perfect breakfast. Outside, the snow is falling while the weather in Astana is just perfect—not too cold and not windy. To me, this is definitely a wonderful day to end my “birthcation” at St Regis Astana. 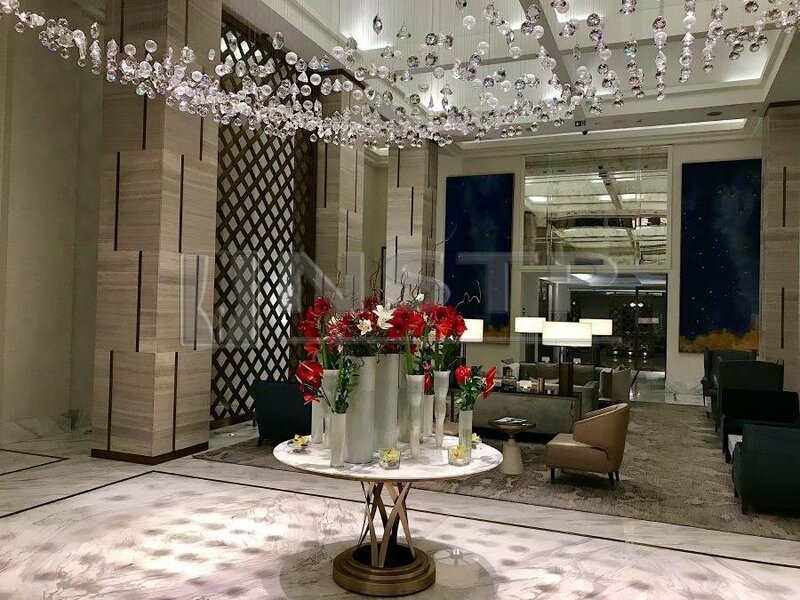 STAY With a total of 120 rooms consisting of 97 Deluxe Rooms, 14 Ambassador Suites, six St Regis Suites, two Royal Suites and a Presidential Suite, St Regis Astana is one of two luxury hotels in the capital of Kazakhstan. Complimentary butler service is available for all room types. EAT two restaurants — La Riviere for all-day dining or The Grill for contemporary fine dining. DO Indulge in exquisite Balinese massage or Turkish Hammam at Iridium Spa or enjoy a relaxing swim at the 117 sqm heated indoor pool. HIGH All staff speak English. Very strategic location, away from the bustling city but not too far out of the city. LOW There was a problem with the air-conditioning system and the room became quite warm for some time.